What Do Fennec Foxes Eat? Would They Make Good Pets? Is Having a Fennec Fox As A Pet Legal? Wouldn’t it be cool to have a fox as a pet? Now that might be possible! Fennec foxes are the smallest of all the fox species in the world. Residing in Desert areas, these animals are nocturnal. They are mostly known for their large, distinctive ears. These foxes easily compare to the size of other household pets. These animals are lightweight with a maximum weight of about 3.5 pounds. Being that they are so small, they only hunt small insects and rodents. This also means that they have a lot of predators. Their predators include eagles, hyenas, jackals, and people. People capture these foxes for the pet trade and/or fur trade. The Fennec fox has soft sandy brown fur which can be very popular and rare in fashion. There is no real information on their species population, which makes it hard to track whether they are in danger of extinction. The most noticeable thing on these small creatures are the ears. A Fennec fox’s ears can grow up to 6 inches long. Don’t be fooled by their appearance, these ears actually serve purpose. Living in the hot desert climate, it is beneficial in that their ears help keep their bodies cool in the drastic conditions in which they live. The large ears also mean they have a heightened sense of hearing. The ears aren’t the only thing that serve a purpose in the Fennec fox survival. Being that they can run 25 miles per hour, this fox possesses a long bushy tail that aids in steering while running. They have curved claws so they can dig their burrows with ease. Their tail also keeps them warm while they sleep in the cool underground burrows. The Fennec fox has great camouflage abilities with its fur color. They can blend with the sand while reflecting the sun light off their bodies, keeping them cool. Their small size makes it easier to hide from predators. Living in deserts, it can be hard to find food. Fennec foxes are omnivores. They prefer any type of desert fruits, leaves, and grasses they can find. On cool nights they also can be found hunting for insects, small rodents, and reptiles. This fox uses its ultra sensitive hearing to hunt their pray. The Fennec fox can get all its water from the things they consume. Their kidneys are designed to keep water loss to a minimum being that they live in desert environments. 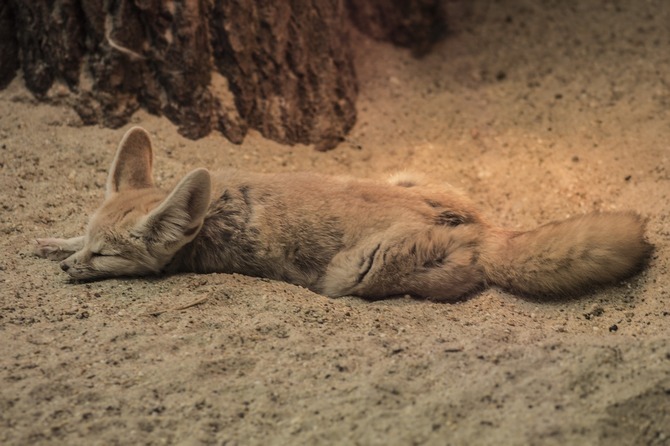 The popular question many people want to know is, “Can a Fennec fox be a good pet?” It would be easy for them to fit the role because they are so small. They are also perceived as “cute” and “furry”. Fox hunters are making a killing capturing and selling this species in pet trades all over the world. All of that sounds good, but is this animal tamable? It is said and proven that these animals can be kept as pets. They are deemed as exotic pets in many places around the United States. This determination doesn’t take away from the fact that Fennec foxes are still wild animals. Having this fox as a pet is like having a dog and a cat mixed. The Fennec fox has the same energy as a dog and a similar sound that compares to barking. These are clean animals with the capacity of being trained to use a litter box like a cat. They can learn to fetch, come, sit, and heal. Training can be difficult but it is not impossible. This fox will always want to play and dig. Being that they are like dogs, you will need to keep them on a leash especially when outside. When they are not supervised in the house, a dog crate or cage will suffice in keeping them out of trouble. What do you feed your Fennec fox? Fennec fox owners typically feed their pet dog food, cat food, raw meat, vegetables, fruits, and vitamins. Your little fur baby will also need a veterinarian willing to treat them. It’s essential that as a potential owner, you do your research and figure out what’s best for your pet. So you’re convinced a Fennec fox is the pet for you. Not so fast! Before you commit to getting this exotic pet, check your state’s laws. After checking your state’s laws, check your city or county laws to be sure. For example, Fennec foxes are illegal as pets in California. They are legal in Pennsylvania and Nebraska as pets though. After doing your research, if the laws check out then you are free to get your own cute little fox. Owning a Fennec fox as a pet will be a lot of work, but it is possible. They are cute little animals that are fairly harmless. There are guides online about owning one so you won’t be completely lost in taking care of it. Training your fox is the key to a peaceful, long lasting owner-pet relationship. Your furry companion can live for 10-14 years so you will share plenty of memories with your fox.